The timing couldn’t have been better: I had just returned home after a two-week holiday (empty fridge, too tired to cook), and Boulder continued to stun with warm, golden Indian Summer days begging for play When Morgan Newlon of rad: real athlete diets invited me to sample some of their meals, I was thrilled. That meant no trip to the grocery store, which thus opened up more time to soak up the last of summer’s rays. These are exactly the type of guilt-free decisions that Newlon wants you to be OK with making. Newlon and his wife Kelly are entrepreneurs whose professional backgrounds complement their recent–RAD has been live for about 2 months–culinary endeavor. Morgan spent many years in the outdoor industry, and Kelly is a professional chef and instructor who also creates nutritious meals for clients at an addiction recovery center. The two love to play outside and love good food, one of the many reasons rad is such a good idea: they live in a town full of people with the same dual passions. RAD’s appeal is far-reaching. People who like to do everything online will love the ease of selecting and ordering meals, while others will appreciate the consistent pick-up location. Everyone, however, will be impressed with the thoughtful ingredients, vibrant flavors, and satiety factor of the food. This was food I felt good about eating, and, I felt well-nourished after eating. When I asked Newlon how they create their menu, his answer was thoughtful and reassuring: rad meals are created for an athlete’s nutritional needs and with a high standard for quality. So, for my weekend of not-grocery shopping and playing outside? 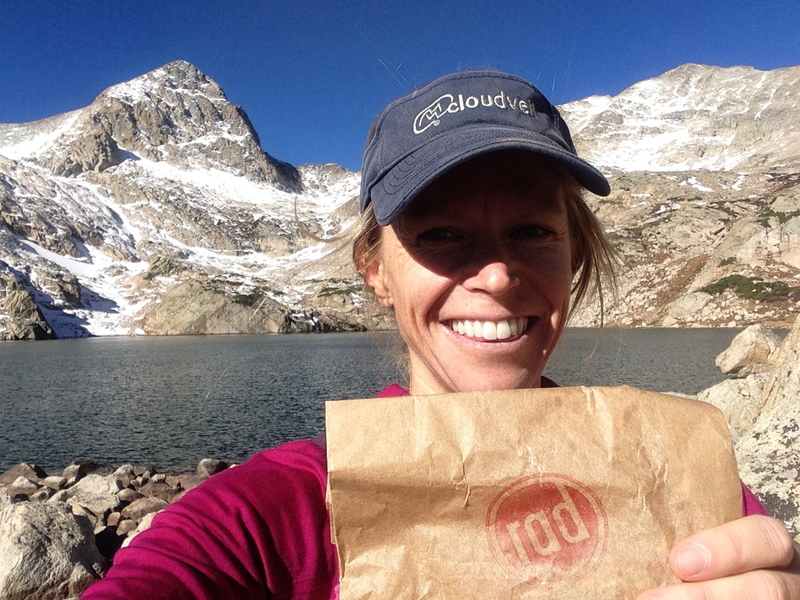 The author, happy to have RAD granola on her trail run. The Chickpea and Chorizo Ragu (post-mountain bike ride at Betasso, plus a yoga class for good measure) was hearty with hint of picante. I warmed it slightly on the stovetop and used crusty bread to wipe the bowl clean. The quinoa-based granola (during-trail run in the Indian Peaks) delighted with quinoa, chia, flax, pumpkin, sunflower, poppy seeds, and tree nuts (hazelnuts, almonds, pistachios) all rubbed in a delicious marinade of coconut oil, maple syrup and some top secret seasonings. It was simple and perfectly toasty sweet. Finally, the Thai Chicken Salad (post-trail run in the Indian Peaks), well, not only was it good looking, but it tasted great, too. Pretty curlicues of carrot and striped candycane beets, black sesame seeds, and deep greens topped with tender chicken and a few thin cucumber and turnip slices (Root vegetables are in season; that was intentional). I had the best of both worlds last weekend–outdoor athletic fun and amazing, nourishing meals. I just might place an order for this Friday.